Well I think it's it is time to get my blogs happening again! Not much time left to take advantage of the Sale-a-bration freebies for 2016. The promotion ends March 31st so get in quick if you still want to get some of the special offers. Remember you only need to spend $90AU before postage to qualify, and for each multiple of the $90 you will get to choose another freebie. Stampin' Up! has a great recruitment offer during Sale-a-bration. Usually, to join up and take advantage of a 20% discount on your products, you buy a starter kit for $169 and you get to choose $245 of any products you like. Well, during this SAB promotion Stampin’ Up! are offering another $60 on top of that so you will now get $295 for just $169 until 31st March 2016. After that to qualify for your 20% discount you only need to spend or sell $440.01 per quarter, that’s $147 per month! When you start you are on Bronze level and when you advance to Bronze Elite you will then receive a 25% discount on your purchases! 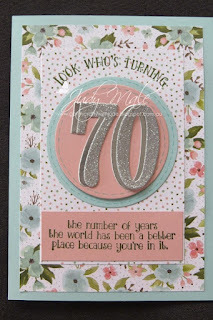 Being part of the Stampin’ Up! family is a wonderful experience to share, you will be able to attend our special Team Days and Events throughout the year that we Demonstrators all look forward to. You can choose to be a Hobby Demonstrator where you simply buy the discounted products for your own use, or you may like to make a little extra money and decide to run your own workshops/classes with your family and friends like I do. It’s completely up to you how much you want to do. So, if you are at all interested in joining my “Getting Crafty with Jude” team please let me know and I will be happy to have a chat with you. 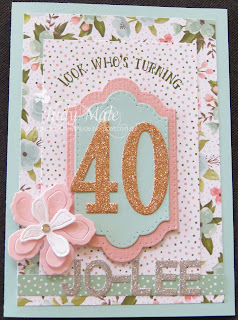 Here is a card that I made using this very pretty Designer Series Paper. Don't you just love the Large Numbers Framelit Dies? Item 140622 $54.00AU These beauties are so versatile and so great for any birthday, but especially for special number birthdays. There is a co-ordinating stamp set too which is awesome. 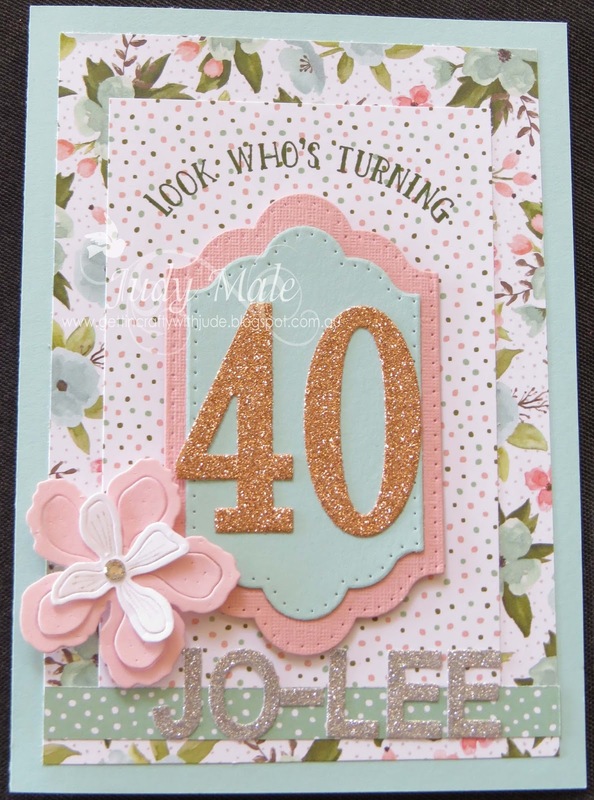 I've used our gold glimmer paper for this card. The flower is from the Botanical Builder Framelits. 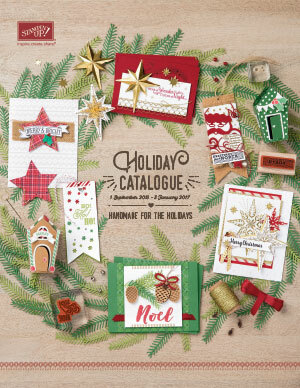 Don't forget that you can choose the Bundle offers in the catalogues so you get to save 15%! 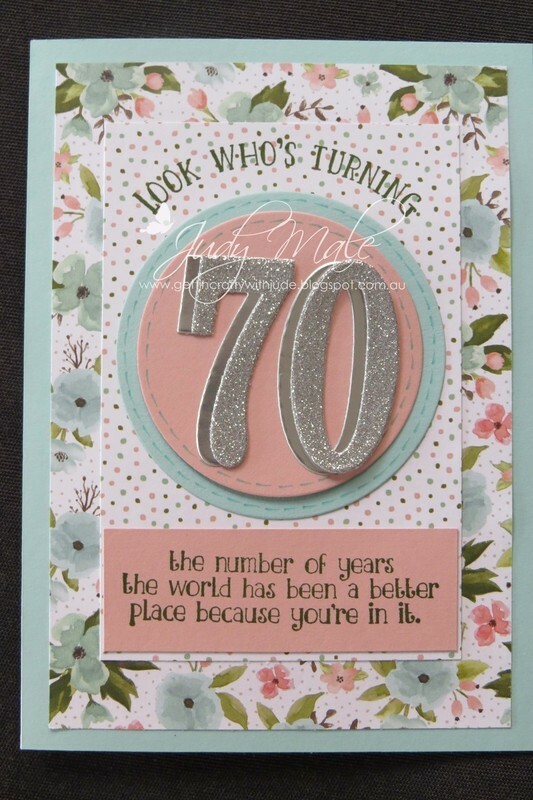 For instructions on how I made this card, please follow the link below. It will take you to my These are My Stamps page. Have fun trying these cards, or design your own, totally up to you.